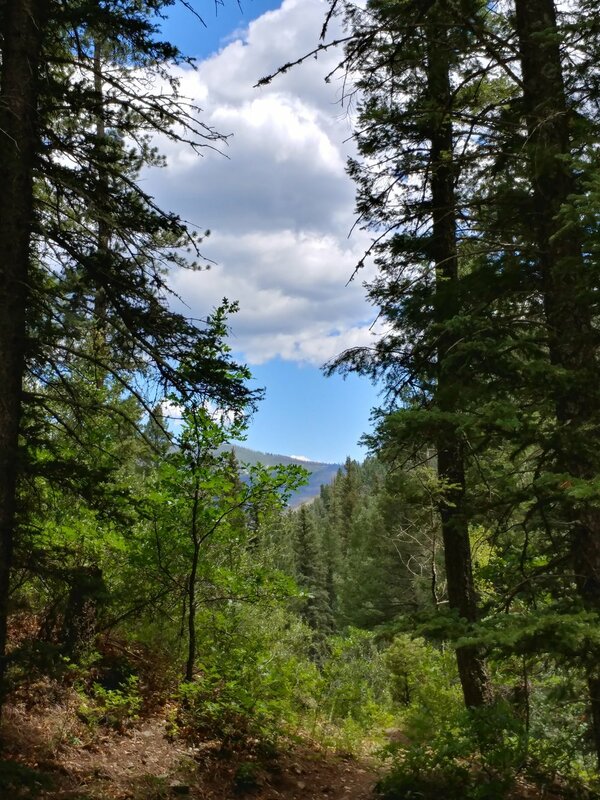 On a whim, we decided that Santa Fe National Forest was the place to go for the weekend. We (my other half and I) had been toying with the idea of going somewhere to escape the annoying Texas heat, but had no concrete plans until Friday night. We went to Target and bought supplies, pulled the gear out of the closet, packed the car, and took a nap. Waking around midnight, I packed the cooler and we were off towards New Mexico! We arrived around 10 am to the area, with a campground arrival around 10:30. We took the last open spot, met our neighbors, and set up camp. The site was open, sunny, and protected on the west side by a hill and tall trees. The campground was in a valley of sorts with tall firs and a mountain creek that could be heard from the tent. There are two trails - Trail 283-A and 283. We attempted 283-A, but only went about a mile overall in and out. It was steep and we were exhausted from driving through the night. We napped. Later that evening, we walked down the road a bit and eventually made our way up to the group camping site and the trailhead for 283. We took that, crossed the creek, and it was a very promising trail until the rain got heavier. We eventually turned around and headed back to the site. We got back to the tent just in time for heavy rains that lasted the next hour. This wasn't the longest hike, but it was bits and pieces of greatness. I will be back to explore this place further. Hike #28 lived up to the ideas behind this challenge - to get out, to hike, to clear my head, and to enjoy life. 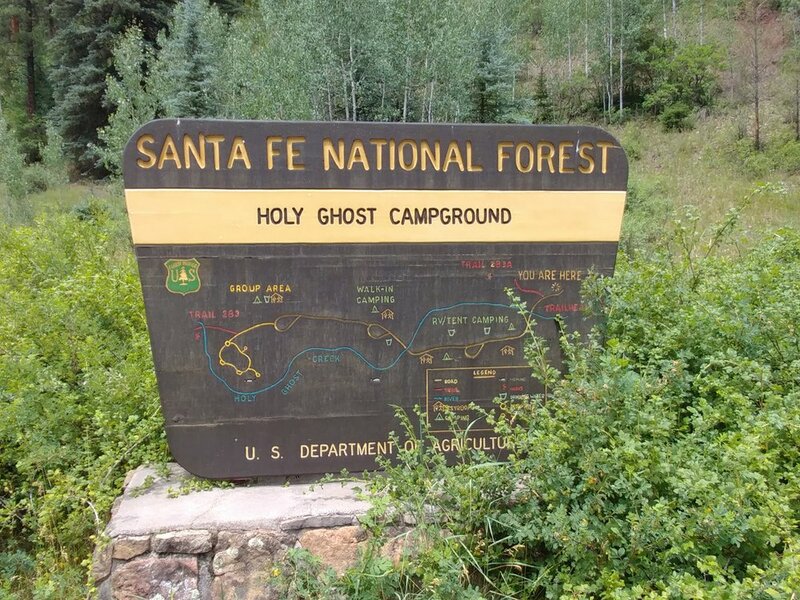 There are a number of trails and campgrounds throughout the Santa Fe National Forest, and surrounding forests, that I feel I could go here once a month and see something new for a long time. Planning ahead is essential. Basic concept that is easily overlooked. I didn't quite investigate the hiking terrain or comments about the particular hike we were going to do and it is just very clear that I should learn a bit more about spots on the schedule for 2017. Proper attire and footwear is the most important. Again, a basic concept that I overlooked because I did not investigate the trail enough. For some reason, I had it in my head that it was a paved path or at least a dirt path and that my street shoes would do the trick...no such luck. Having an offline map or physical map is highly recommended. I was fortunate enough to have the trail on my phone, so we could ensure we were on the correct path (as there were splits in the woods) going forward. In the future, I will probably use AllTrails or some other app or print a map if it is available online. Hydration is key to feeling good. I planned ahead with water, but didn't research the trail enough to know I should have taken it with us. All was well, luckily. I learned how to hike with my dog. Chewy the dog has been in the woods and on trails before, but never like this. He was a champ and let me know what he was okay with and what he was capable of handling. 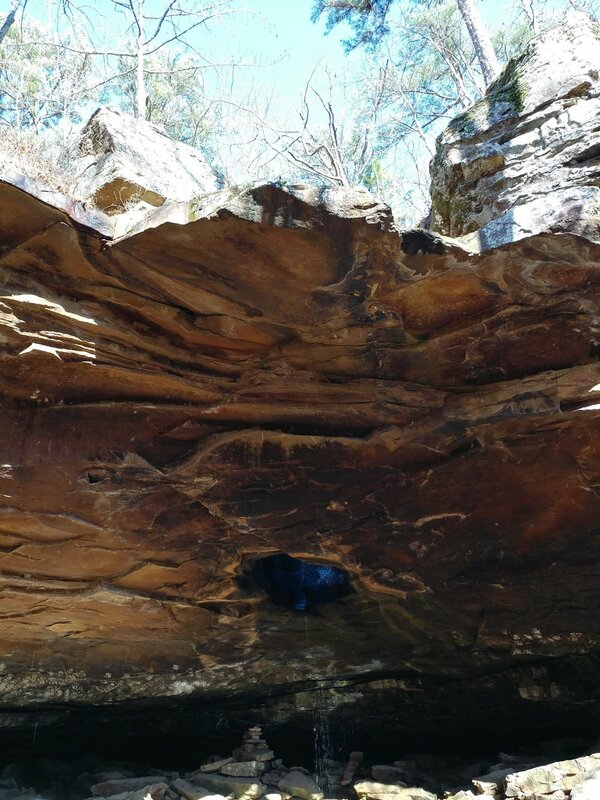 For a dog afraid of bridges and stairs, sometimes, he was certainly not afraid of cliff-like rock edges. Go figure. I've come to terms with the fact that I will be driving anywhere from 1-8 hours to go hiking and I may not spend an equal amount of time in the woods/on the trails. Hopefully a few more "preview" hikes to come, as I schedule the first month.